This morning, I testified in Congress on technology to combat waste, fraud and abuse in the Medicare program. My testimony focused on the expectations of smart cards. The testimony can be downloaded from the House website. I noticed an odd filename that legislators assigned to my testimony. Seems reminiscent of Arnold Schwarzenegger, but hopefully unintentional. This Wednesday, I'll be testifying in a U.S. House hearing to examine options to combat health care waste, fraud and abuse. This service has rustled up memories of my time as a tech gopher at Holland Community Hospital in the 1990s when the hospital deployed second-factor authentication tokens for clinicians (i.e., 2nd factor = something you have rather than something you know). One of my tasks was to write software to quickly and effectively detect incorrect entries in the hospital's voluminous general ledger. Medical billing records. So exciting. I remember replacing lost "authentication keys" for nurses and physicians who would visit my tiny time-shared desk next to machine room for the soon-to-be-retired VAXen, line printer, and reel-to-reel backup. At the time, the authentication keys were literally shaped as plastic keys. Each clinical computer had a key reader connected via serial port. Clinicians would insert and twist the key in order to access the clinical computing systems. Removing the key resulted in automatic log out. I am told that the system lives on today in some form nearly 17 years later. What's changed across the nation in terms of health care cybersecurity since the 1990s? Malware spreads by USB sticks and IP networks rather than 3.5" disks. Medical devices depend much more on networks and software. There are now so many layers of software dependencies, it's hard to even inventory what's in the trusted computing base. I still have the wooden shoe presented to the staff who helped "go live" with this clinical computing system in Holland. Stored on a shelf right above my IHTFP propeller hat. Semmelweis is credited as a pioneer of antiseptic technique. How do we begin to improve the information security of increasingly interconnected and wirelessly controlled medical devices? Starting with highly trained engineers who also appreciate the complexities of human factors and regulatory affairs. My upcoming Winter 2013 course at the University of Michigan on Medical Device Security will be the first of its kind in the nation to teach students about this topic. Students will learn the timeless concepts and cutting-edge skills in computer engineering, human factors, and regulatory policies that determine the safety and effectiveness of manufacturing software-controlled medical devices. Students will apply the newly learned concepts and skills by analyzing the security of a real-world medical device in a hands-on term project. Interdisciplinary teams will consist of students from complementary backgrounds to mimic the composition of teams at medical device manufacturers and regulatory bodies. Occasional guest speakers from medical device manufacturers, hospitals, and government will complement the classroom activities with critical lessons from the front lines. Hurricane Sandy gave me to opportunity to try out some drawing programs while stranded in Minneapolis. 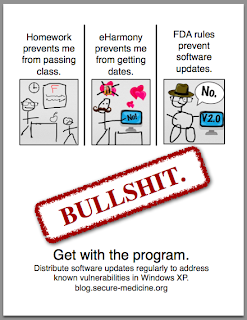 Here's my artistic interpretation to expand upon my earlier post to encourage regular cybersecurity patches for medical devices that depend on COTS software like Windows XP. You can download the PDF poster here. Consider posting near your hospital CIO's office. This poster has been verified and validated by smart engineers from the medical device manufacturing community (they liked it, so I am sharing it). Stop the insanity. 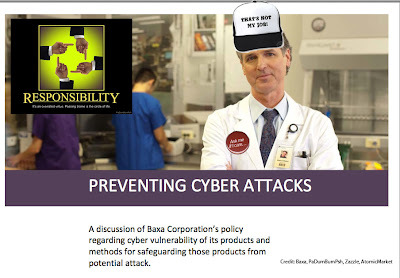 Stop sensationalism of medical device security. I am tired of hearing about medical device security "news" chuck full of sensationalism and hyperbole. You don't have to shout that the sky is falling. It's not. Yes, there are real cybersecurity problems for medical devices that need innovative engineering and policy solutions. But there is no reason to panic or run for the hills in fright. Even though it's Halloween. The latest example is an abstract at the Medical Device Connectivity Conference that I did not write. I was aghast when I read what the conference had written as a placeholder for my talk on medical device security, as I have no intention to play the doom-and-gloom card about hacking medical devices. Yes, medical devices can be hacked. Surprise. Yes, it's important to share the facts for science and engineering. But let's focus our attention on improving public health rather than what sells headlines. Here's the revised abstract that will appear in a reprint. By Kevin Fu, 4th Annual Medical Device Connectivity Conference & Exhibition, Joseph B. Martin Conference Center at Harvard Medical School, Boston, MA, Nov 1, 2012. We've all seen the news stories about hacking implanted pacemakers and patient worn insulin pumps. However, what keeps me up at night is a more mundane security problem: unavailability of patient care. When conventional malware shuts down a cath lab, seriously ill patients can be subjected to unnecessary risk of transport. When a medical system is not available for use, patients do not receive the quality of care they deserve. This presentation will explore the risks, realities and countermeasures of medical device system security. Systems considered will range from purpose-built systems like pacemakers and programmers to embedded system medical devices interconnected on enterprise wide IT infrastructures. The effectiveness of current methods, tools and countermeasures will be discussed, with an emphasis on continuing gaps and vulnerabilities. Best practices for manufacturers and providers will be presented, as well as predictions on emerging risks. If you can't wait until Thursday, then you can skim a related talk on regulatory responsibilities for medical device security that I gave yesterday at the Regulatory Affairs Professionals Society in Seattle. There's no reason to panic. Just be informed and commit to improving the cybersecurity of increasingly interconnected medical devices. Manufacturers ought to provide regular software updates to address known security risks in medical devices that utilize off-the-shelf software like Windows XP, OS2, Linux, etc. Some do. Some don't. The next time a manufacturer refuses to issue a software update for a known security problem in your hospital computing systems, send them this blog entry. Ok, you're with me right? FDA explicitly says that manufactures should issue software patches to address cybersecurity problems. Another question that always comes up is; I’ve gotten calls from users and they’ve said they’ve call the device manufacturer and the device manufacturer says, “I can’t do anything, I have to get FDA approval.” So we went back and examined this question and the answer is that pre-market review of a software patch or a cybersecurity update, usually does not require and FDA pre-market approval. FDA premarket review is rarely required prior to implementation of a software patch. FDA has previously published detailed guidance on when FDA review of a design change is required, and most cybersecurity patches fall below the threshold for FDA review. 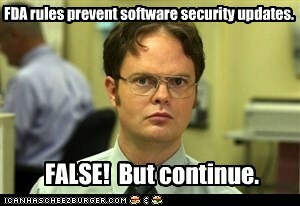 Ok, so why do manufacturers make the dubious claim that "FDA rules" prevent them from issuing software updates? I think there are at least a couple rational reasons. 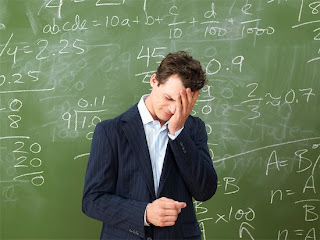 First, regression testing, validation, and other good manufacturing practices are non-trivial. It can take a heck of a lot of work to perform testing. The last thing a manufacturer wants to do is accidentally brick a medical device with an errant update. Remember back in college when getting code to compile was the last step of success? Yeah, well good manufacturing goes a wee bit further. Back when I worked in the software industry, the savvy software engineers ran automated regression tests every night and sometimes even after each new commit of code to the source repository. I imagine most medical manufacturers have such automated testing suites, but it still poses non-trivial challenges. How do you automatically validate things that connect to non-deterministic patients? Moreover, how do you perform testing on a component that will interoperate with other unknown components from different manufacturers? On modern medical devices, it's not feasible to "check the behavior of a complicated device to every possible, conceivable kind of input." A whole discipline of system engineering exists to help tame such complexity. A second likely reason is that guidance documents are peppered with conditional language open to interpretation. If you want to scare a regulatory affairs specialist, just add a bunch of implicit "if" or "unless" conditional branch statements. So what happens when a risk-averse decider sees a statement like "rarely does..." or "if X, then cybersecurity updates do not require pre-market review"? Ah, to be safe, let's just assume !X. Therefore, the dubious claim comes true. Not sure how to fix this one. Manufacturers: listen to your engineers. FDA: make your guidance less fuzzy. I hope legislation is not necessary to solve these engineering and economic incentive problems. Do the right thing. If. Unless. So report me, maybe. In summary, the absolute claim that "FDA rules prevent software security patches" is false. But there is a half truth hiding behind the sentiment. The rules are sufficiently fuzzy to cause misunderstandings and unintended interpretations. A manufacturer needs to plan ahead for these foreseeable cybersecurity risks, and budget for the inevitable software updates and regular maintenance. Hospitals need to ask for and pay for the services for regular and timely security patches. There's no perfect engineering solution, but not issuing any security patches for medical devices running on antiquated Windows XP is a decidedly unhelpful approach. Go read the presentations from FDA on the topic of software updates. I know of one hospital that uses these slides to confront manufacturers unwilling to issue security patches. "ECRI Audio Conference. Virtual Patient Safety: Worms, Viruses and Other Threats to Computer-Based Medical Technology" by Alford Taylor, FDA CDRH, November 2003. "FDA Regulatory Perspectives: Presented to the Philadelphia Area Medical Instrumentation Association" by Alford Taylor, FDA CDRH, February 2004. "Medical Product Software Development and FDA Regulations" by Cark Wyrwa, IEEE Orange County Computer Society, March 2006. Malware in hospitals? Time to come clean. 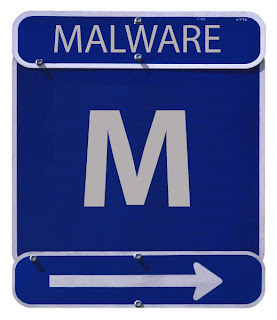 I receive phone calls from hard working clinical engineers, physicians, and IT specialists in hospitals asking what they can do about the relentless malware in their "user facilities." Some relay anecdotes as gallows humor, others are downright fed up. At some point in every call, I raise the provocative question: "So, how many voluntary MedWatch Form 3500s did you file on these security problems on medical devices that could lead to patient harm?" In all cases, the callers cite various disincentives for reporting. The reasons range from despair to workload to fear. Despair because there's a feeling of hopelessness that reporting a problem would have little chance of being read (well, that's self-fulfilling). Workload because it's unrealistic to expect a health care professional to interrupt the busy clinical workflow to file a voluntary and tedious MedWatch report on an engineering problem. Fear because whereas there's elements of immunity for reporting "near miss" safety issues in the avionics community, there is no such immunity for voluntarily reporting a "near miss" in the medical world. There are plenty more reasons that contribute to FUD and the classic bad-news diode, but unfortunately there are few incentives to officially report security problems other than "patients deserve better." So...all my frustrated and overworked colleagues in healthcare delivery who wish to see safety and security improvements in medical device software for patient care: send me your security anecdotes! Tell me about what devices are prone to infection in your user facilities. Tell me what devices are more resistant. Tell me what manufacturers you feel do a good job at implementing a total lifecycle management for medical device software. I have already received database entries of malware infections in clinical settings, and this data is helping to raise awareness to the most problematic devices. It sure would be nice to have some positive examples too. I'm also looking for photographs of interesting security failure modes on medical devices to help illustrate the problem. A radiology workstation with a BSOD or Windows 95 logo? Virus warnings on a compounder? A cath lab shutdown for decontamination of malware? If you see a malfunctioning or compromised medical device, consider sending me a photo. Your report of medical device security problems can make a difference in improving patient outcomes! However, there is another set of risks to consider. As discussed above, the GAO report analyses the security risks of these compact, resource-restrained implantable devices. This is, of course, critical given the device’s impact on patient health and potentially, life or death. But the medical device infrastructure of healthcare systems and hospitals is far more complex. It includes a wide range of medical devices from simple to complex, from small to large, built on proprietary platforms or based on commercial, off-the-shelf software (COTS). The latter introduces its own set of risks through a “PC under the hood” design approach since the commercial operating systems or other software can easily become an entry point for malware, whether it targets the specific device or generally exploits a vulnerability specific to the chosen platform with the device then becoming “collateral damage”. In effect, Symantec is asking whether the scope of the GAO report was too narrow to capture a generalizable set of lessons about the ecosystem of medical device security risks. The implication? The medical device security iceberg is much bigger that the GAO report would indicate. What questions do you have for the GAO, FDA, and hospitals regarding recent GAO recommendations to improve medical device security? If you have a burning question, please post it in the comments here. Or if you are bashful, send your question to me directly. I will attempt to raise the suggested topics during the panel, and post the discussion audio on a later blog post. Today, the U.S. Government Accountability Office (GAO) issued a set of recommendations to improve the information security of certain medical devices. Congressional lawmakers who requested the GAO review issued the following response. In August 2011, the lawmakers had asked GAO to investigate the topic. In April 2011, I submitted a document on software issues for the medical device approval process at a Senate hearing on "A delicate balance: FDA and the reform of the medical device approval process." The document raises questions about how to improve the trustworthiness of medical device software. A more in-depth survey on trustworthy medical device software was commissioned in 2010-2011 by the Institute of Medicine for a panel investigating the FDA 510(k) clearance process. Your medical device is secure as long as you don't plug it in. To use it, first plug it in. "I equate this to buying a high-end automobile - such as a Mercedes Benz - and having it delivered with old-style drum brakes and no power brake system, and the salesman advising, "Keep it under 20 mph and you should be able to stop with no problem." The risks presented by this would simply not be accepted by the customer base; no one would purchase the vehicle, and it would soon no longer be offered." 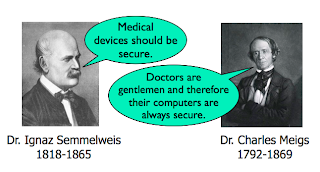 It's an interesting analogy to ponder as hospitals and manufacturers struggle to reach consensus over (1) what exactly are the problems facing medical device security, and (2) what are the most effective approaches to systematically improve security. No more wack-a-mole approaches, please. These security issues are really hard to solve because of both technical and managerial reasons, among others. The good news is that some manufacturers (especially in the cardiac rhythm management and diabetes management markets) are beginning to integrate security thinking earlier in the medical device manufacturing processes. I've met some really smart medical device engineers who are excited about improving security and privacy. Manufacturers playing catch up should take a page from the companies who are succeeding at integration of security processes into manufacturing, but a danger is that it's often hard to distinguish good security from bad. Beware of snake oil. We owe it to patients to improve security of connected medical devices. Security is an important public good! The full article by Mark Olson appears at Healthcare Info Security. We have a nice set of folks registered to attend ACM MedCOMM in person, but we also want to make sure that others unable to fly out to Helsinki can watch the talks too. So we have arranged to webcast the talks LIVE with Regis. Well, Regis wasn't available. Kevin will introduce the distinguished speakers on medical communication systems. There are experts from the medical device industry, government, and academia on topics ranging from wireless neural interfaces to electromagnetic compatibility to security and technology ranging from wireless power to body area networks. Carefully sip your favorite caffeinated beverage that isn't linked to serious health consequences, wear your fire-retardant pajamas, and join us from 9AM-5PM Helsinki time on August 13 at http://spqr.cs.umass.edu/events/2012-medcomm/. That's 2AM-10AM Eastern time. Viewers can submit questions via twitter. Get an early start on your day before your supervisor expects that completed safety case for your next generation medical device! Today, the PLoS ONE journal has published our analysis of a decade's worth of public FDA data to gain insight into the security and privacy qualities of medical devices. The technical paper appears at PLoS ONE. This interdisciplinary research was made possible by the DHHS SHARPS project and the Trustworthy Computing/Secure and Trustworthy Cyberspace program at NSF. This work was sponsored in part by Health and Human Services (HHS) Grant Number 90TR0003/01 and National Science Foundation award CNS-0831244. The contents of the paper are solely the responsibility of the authors and do not necessarily represent the official views of the Department of Health and Human Services. The funders had no role in study design, data collection and analysis, decision to publish, or preparation of the manuscript. Any opinions, findings, and conclusions or recommendations expressed in these materials are those of the authors and do not necessarily reflect the views of NSF. Clinical engineers and biomedical engineering staff who are wondering about the extent of the problem of medical device system security can participate in my upcoming webinar with the American College of Clinical Engineering on July 19th. I'll talk about security issues often associated with medical devices, common roles and responsibilities of both the provider and the vendor, identification methods of vulnerabilities and best practices to minimize those vulnerabilities. Come hear the bad news and good news about medical device system security. A question/answer period will follow the presentation. Find out more from the ACCE website or the ACCE Facebook page. Join us at the ACM Workshop on Medical Communication Systems! We don't just love repeating letters mid-word—we are practicing our Finnish for the first ACM SIGCOMM Workshop on Medical Communication Systems (ACM MedCOMM) to be held in Helsinki, Finland on August 13. MedCOMM brings together scientists, engineers, standards-committee members, patient advocates, security researchers, pickled herring, students, and medical experts to evaluate the state of the art in communications for medical applications. We'll talk about how to build systems with better security, spectrum utilization, interference properties, power consumption, and patient-friendliness than what exists today. We'll draw people and insights from the SIGCOMM community, where last year's "best paper" concerned medical-device security and involved software radio, jamming, and some fundamental full-duplex radio action. Check out the lineup of invited talks and papers and join us for this full-day event in Helsinki on August 13! The draft PDF program complete with visuals provides further details on speaker bios, implants, etc. You can register by July 9 to save €40 off the registration fee—and you'll also get a week's free passage on public transportation in Helsinki. Imagine you'd like to test X-ray machines in a hospital, dental office, etc. for safety and calibration. X-ray testers come into play. So how does one maintain the software used with X-ray testers? How do you know that you've downloaded the legitimate software? 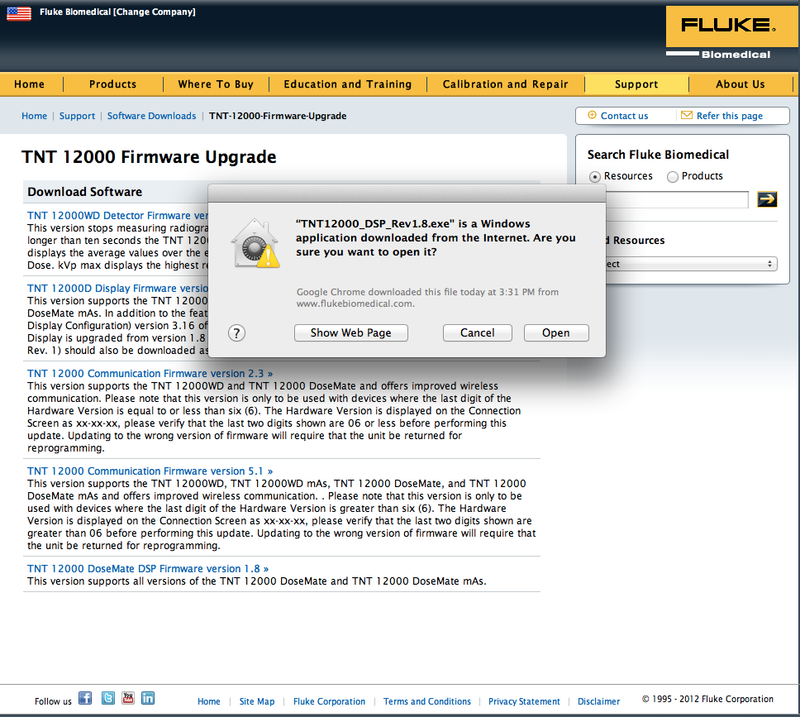 The TNT 12000 X-Ray Test Device from Fluke Biomedical distributes its software updates online. Worried about the security of your hospital network while downloading software? Concerned that installing software might violate your hospital's corporate security policies and get you in hot water with your CIO or CISO if you accidentally download malware? No problem. Trust the Internet. Just download the .EXE file or the ZIP file using any shared Internet connection from an HTTP site. 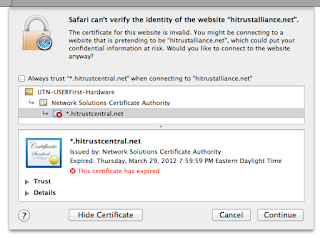 No need for connection-oriented SSL security or pesky end-to-end digital signatures of integrity-protected content. Another time saver for increased productivity. Earlier this year after speaking about medical device security at a Semiconductor Research Corporation event, I got the gift of food poisoning that landed me in an ER. I enjoyed a warm IV and a Philips Medical Intellivue patient monitor. As I writhed in pain, I wondered how the hospital updated the medical device software. Here's how. 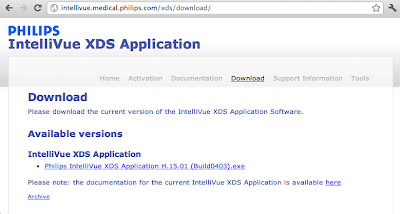 Download an unsigned .EXE file from Philips Medical. In many of our products, we provide you with a controlled update repository to reduce the risk of equipment outage due to unauthorized or faulty anti-virus signature updates. Many? Many is a euphemism for we're sorry that we cannot quantify our cybersecurity preparedness. There is a diffusion of responsibility between hospitals and manufacturers that leads to certifiable finger pointing over security of medical devices. It has already been almost a decade since Philips discussed the problem of medical device security. 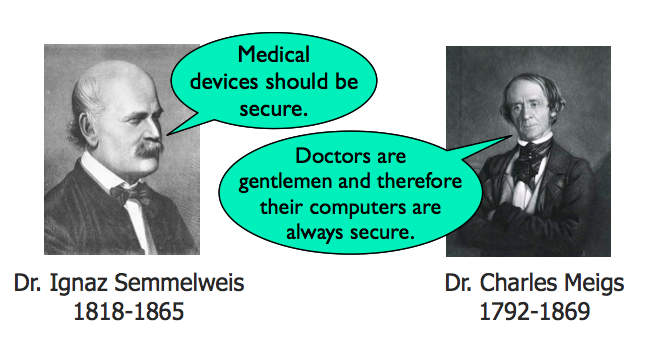 Let's hope that achieving reasonable medical device security doesn't take as long as it took physicians to accept the advice of Semmelweis et al. on the importance of hand washing. That was 1847. And hand washing is still a problem. Today FDA released its FY2011 OSEL Annual Report. Of relevance to medical device software, Figure 5 on page 22 charts the impact of software on medical device recalls. The figure indicates that last year, about 24% of FDA recalls of medical devices were attributable to software failures. The report also proposes an analogue to "flight data recording" to get better introspection into adverse events on medical devices (page 39). Software updates are hard to write well. One example is the McAfee update that reportedly caused thousands of computers to get stuck repeatedly rebooting. I am often asked why it's hard to automatically securely update software on a medical device. 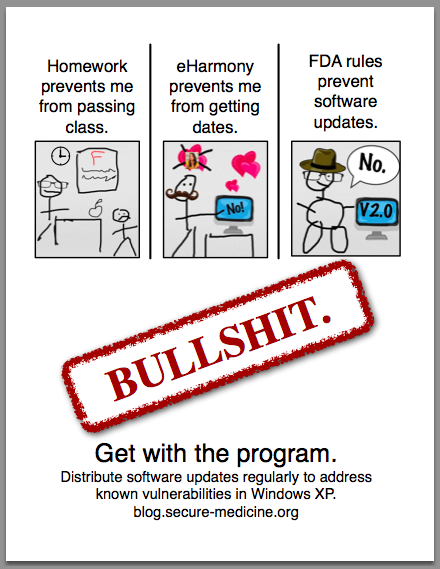 I think the example from McAfee is illustrative: what does a person do when a software update goes awry? For a desktop computer, one can call tech support and grab a cup of coffee until the computer is repaired. With a medical device, there is much less room for error and the consequences of downtime (or erroneous operation) potentially higher. Software updates are hard to get right for personal computing, and software updates for medical devices have less wiggle room for error. Click Here to Download Your AVEA Ventilator Software Update. Trust Me. Summary: The web server distributing the software updates for a ventilator (a medical device) itself needs some help with software updates. According to Google, the web server was infected with 48 viruses and 2 scripting exploits. 20 pages resulted in malicious software being downloaded and installed without user consent. The risks should be obvious. 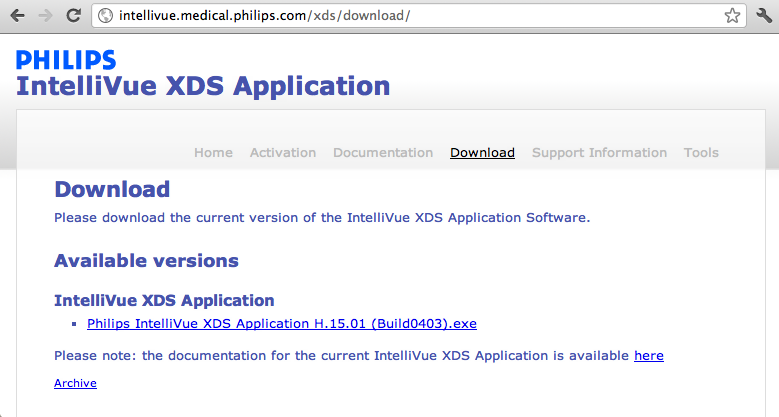 This is an update for a medical device, and yet one must download it in a manner as if software sepsis is no big deal. Health care professionals might as well stop their washing hands while they're at it. Hospital IT staff: How much do you trust the Internet for updating medical device software? A number of researchers in software upgrades bemoan the general state of the art for secure software updates. Worse, the cryptographic technology at the core of commercial software update mechanisms is broken and being actively exploited by the Flame virus. Well, if you work for a hospital, the Flame virus is probably the least of your worries. You just want to keep your HIT systems and software-controlled medical devices working. Vendors routinely install software updates for medical devices from the Internet or USB keys. I've seen medical sales engineers download pacemaker-related software from the Internet. 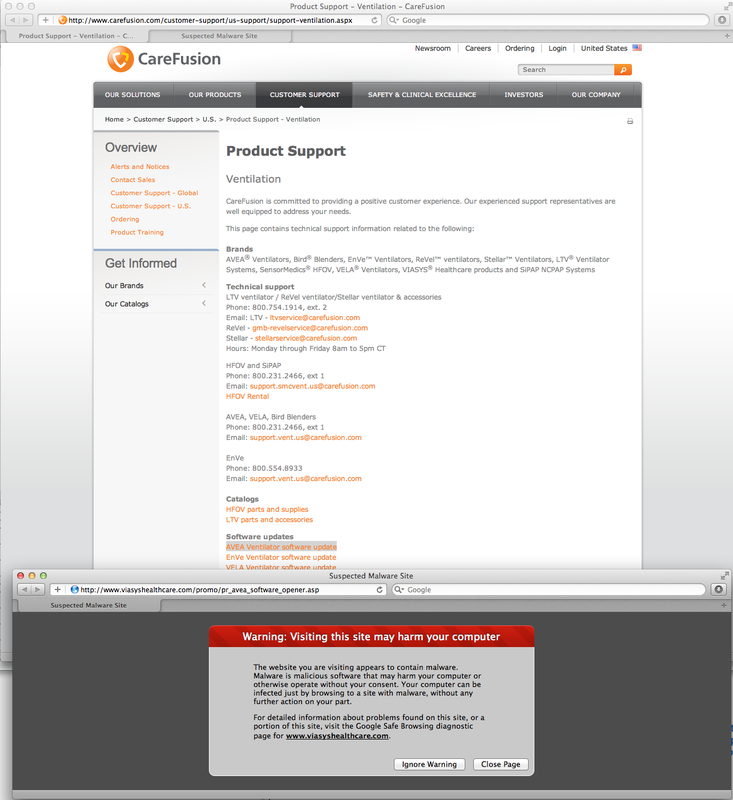 Today I tried to download a software update for CareFusion AVEA Ventilators. What I found may disturb hospital IT staff. Here's a screenshot. When I clicked on the highlighted link for "AVEA Ventilator software update," a second dialog box popped up, "Warning: Visiting this site may harm your computer." What happened when Google visited this site?Of the 347 pages we tested on the site over the past 90 days, 20 page(s) resulted in malicious software being downloaded and installed without user consent. The last time Google visited this site was on 2012-06-08, and the last time suspicious content was found on this site was on 2012-06-03. 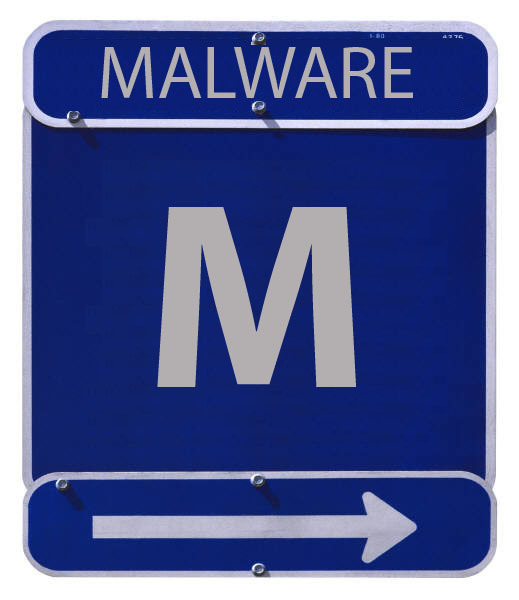 Malicious software includes 48 trojan(s), 2 scripting exploit(s). 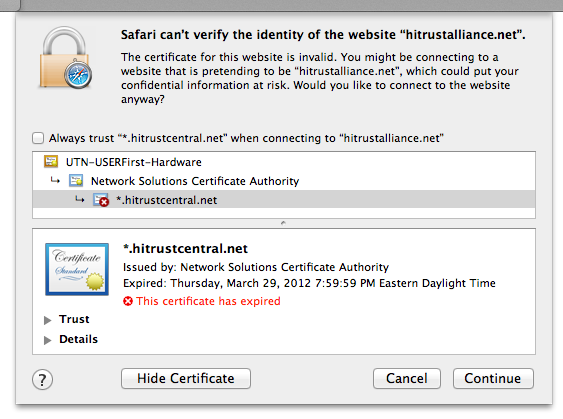 Malicious software is hosted on 3 domain(s), including nikjju.com/, lilupophilupop.com/, koklik.com/. 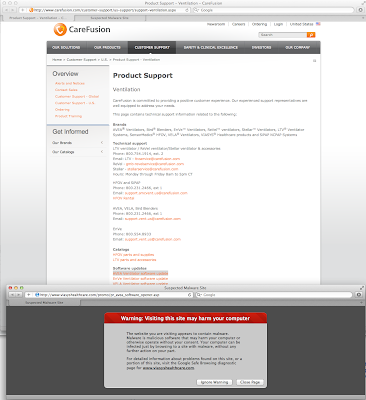 This site was hosted on 1 network(s) including AS26651 (CAREFUSION). Of the 3 site(s) we tested on this network over the past 90 days, 2 site(s), including, for example, viasyshealthcare.com/, sensormedics.com/, served content that resulted in malicious software being downloaded and installed without user consent. The last time Google tested a site on this network was on 2012-06-08, and the last time suspicious content was found was on 2012-06-06. On the same site, I found another product that discusses its software update mechanism for Cortical Stimulator Control Units. 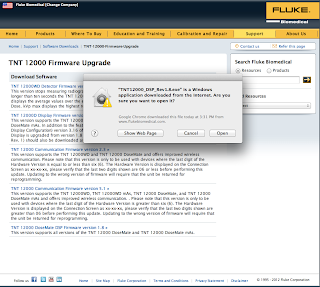 The company advises its customers to "Click Run" when the "File Download Security Warning" dialog box appears. The instructions appear to refer to a CD rather than an Internet download, but I wonder how many technicians take a short cut by downloading an update via the Internet. That Internet is so darn convenient. I find it difficult to establish trust in the safety of software affilatied with reports of "malicious software being downloaded and installed without user consent." What's the way forward? That's a longer discussion. Let me update you over drinks. For starters, go read the Google papers on web malware [Trends in Circumventing Web-Malware Detection and All Your iFRAMEs Point to Us]. Here's to a better and more secure software update infrastructure. Cheers.